Few days back, one of my friends asked me about the tips to wrap a tennis racquet because he wanted to gift a new racket as a birthday gift for her fiancée. Be it a Christmas or a birthday of your loved one, gifting a tennis racquet can be a fantastic idea for any tennis player. If your friend or a family member is passionate about tennis game and if they are regular tennis players, then the best gift you can give them is a quality and reliable tennis racket. But I have seen many people face difficulties and feel confused when sending a tennis racket as a gift to their loved ones. I know how it feels when you do not know how to wrap a tennis racquet as a birthday gift for your friend who loves to play tennis. Learning to properly wrap any tennis racquet can be tricky and time consuming process when you do not know the actual steps to do it properly. The racket is some of the most unusual gifts that need some skills to wrap with care. To make this racket wrapping procedure easy and hassle free, I am providing some important tips that I believe will help you surely. So, keep reading to discover how to wrap any tennis racquet as a gift for your friend or a relative or a close family member. Before you read my special tennis racquet wrapping tips, I recommend you to watch this very helpful instructive video from Howdini. This video exactly provides all the actual steps for wrapping your racket with the help of tissue papers, single sided and double-sided tape. Now that you have watched this video till the end, I will give my special tips regarding learning to wrap a tennis racket as a gift and also to ship it securely. Firstly, you can visit your local tennis shops and ask the owners about the availability of empty tennis racquet boxes. I am sure they will have plenty of boxes lying around which they will provide you happily. Use these boxes to wrap and ship the new tennis racquets to whomever you want to gift. There are even some companies that provide online tennis racquet shipping boxes along with bubble wraps and a packaging tape. These heavy-duty corrugated shipping boxes come is 13 inches x 3 inches x 30 inches dimension. This means you can store the racquet inside these boxes which have dimensions up to 30 inches in length, 13 inches in width and 3 inches in terms of thickness. These types of boxes provide extra padding. You can also place bubble wraps inside the box to make the racket more secure and safe. After this, when it comes to actual wrapping of the tennis rackets, large sized tissue papers are easy to handle. I generally use premium quality tissue papers for gift wrapping from Artverse. They can be used to provide proper shape for your oddly shaped gifts. You can provide a rectangle or circle shape to your tennis racket using just tissue paper. So colored tissue papers will do the trick that can help you conceal your gift properly. Just using 2 large pieces of tissue papers on the upside and 2 pieces on the downside of the racket will help you properly wrap this gift item. To keep the gift secure and neat inside the tissue paper, you can use single sided and double-sided duct tape. Another idea you can implement is to use colourful gift papers to wrap the head of the racket that you want to gift to your loved one. Try to make it look like a lollipop or a blossomed flower so that the person whom you want to provide a gift, will not be able to guess it easily. Using ​premium DIY washi tapes and stapled paper can be another great idea to wrap any kind of tennis racket in simple steps. There is a section on Huffingtonpost.com site about wrapping 10 oddly shaped gifts where you will get the actual steps to wrap all types racquets at your home. In this method, you can make use of easily available kid’s butcher paper at your home. Just cut out 2 sheets of paper by keeping about 4 inches of buffer space around the racket. Then wrap them around the racket on the upper and lower side. Stick all the sides of the paper with the help of double-sided tape. Once you pack the racket properly with the cut out paper, you can decorate the front portion of the paper with the help of Artit Washi tapes. You can give it a sporty and interesting look with these colourful tapes. The only precaution you will need to take here is not to buckle the stapled paper in spots. Just try to keep the paper as flat and smooth as possible. You can also use stapler to seal the racquet wrap properly. The next important tip that I would like to share with you guys is the quantity of gift wrap paper. You will always need to use at least 2 gift wraps for upside and down side. This is essential to make sure you wrap the racket neatly and the racket will fit properly inside the wrap. Once you wrap the tennis racquet, you can create an inspirational message related to the tennis world. This is a great idea to motivate and inspire your loved one who is going to receive this useful gift. Now once properly wrapped with a stapled paper, you can also learn how to ship your tennis racket from the comfort of your home. If you want to ship this wrapped tennis gift securely and safely, then you will only need a medium sized cardboard box, a pair of scissors, bubble wrap and a packaging tape. Here, the box you take should be bigger in size as compared to the size of your wrapped racquet. You will require a box that is longer in term of its length. Then with the help of your scissors, you can cut the box and customize it according to the size of your racquet. Now you can use a Duck Bubble Wrap Roll to safely cover the racket inside. I recommend you to make the two layers of bubble wrap just to be on the safer side. Then use the packaging tape to make the package neat and secured. Watch the following video that will teach you how to properly ship a tennis racket as a gift using cardboard boxes. Finally, place the racket inside the cardboard box and then close all the sides of the box properly. And use packaging tape to stick all the sides properly. This is the step where you need to make sure that the racquet which is placed inside the box must not be able to move during the entire shipping journey. You can make use of more bubble wraps inside the box so that the properly wrapped racquet will not move easily. Besides this shipping method, there are 2-3 more methods available that you can use to securely send the racquet to whomever you want. You can buy a long flat box that can perfectly store the racquet and then you make it secure with a bubble wrap. Another method I have seen other people using is to make use of two flat cardboard boxes that are stacked on one another. Then use bubble wrap or stapled paper to stuff inside the boxes. I have heard from many folks that this is not a very reliable method. So, I will not recommend this method for you. One of the other most reliable tennis racquet shipping methods is to use large poly bags. You can first use a tennis racquet case to store the racket inside and then cover it with bubble wrap. And finally put this package inside the large poly bags. This method, I believe is second most reliable and secure way to ship tennis racquets. You can purchase 100 quantity 19 x 24 Metronic white poly bags from Amazon online. I believe these bags are widely used by people, they are waterproof and they are highly durable in nature. Plus, you cannot see what is inside from these bags due to their outer white surface and inner black lining. 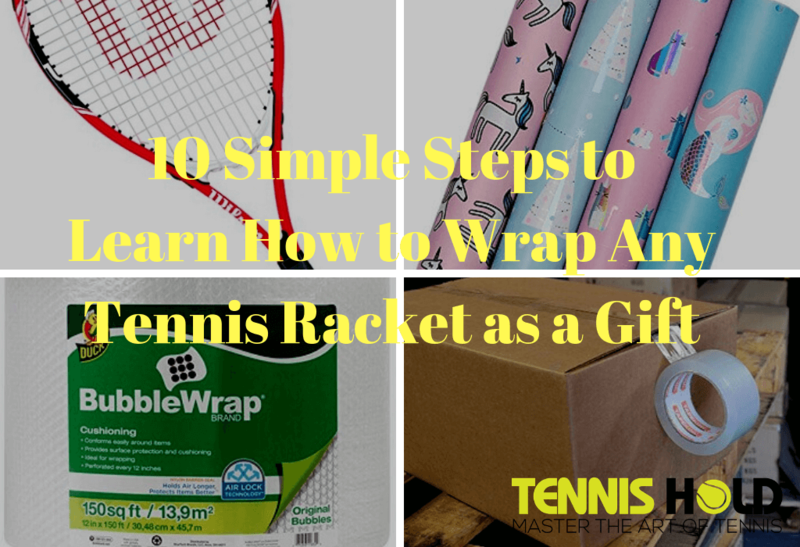 I believe these 10 tips will definitely help you in learning how to wrap any tennis racket and also ship any tennis racket easily from your home. Just try these methods and I believe you will be able to save some money on your racket wrapping and shipping charges.